Clasp/Buckle: Stainless steel Omega deployant clasp stamped "1039" and "4 67"
Accessories: Accompanied by Omega Extract from the Archives confirming production of the present watch on October 7, 1968 with black and red with luminous indexes and its subsequent delivery to Switzerland. Reference 145.012 was in production from 1967 to 1969. It is the successor to ref. 105.012, with one of the main improvements being the new pusher styles, taller than the previous iteration. Furthermore, some examples of this reference mount special pushers with even higher water resistance capabilities than the standard ones. Such models are identified by the SP designation at the end of the reference (SP standing for Special Poussoirs - Special Pushers), such as the present specimen. The model undergoes subtle design changes during its lifetime, most notably moving from a chronographic seconds hand featuring a “teardrop-style” tails in the first examples to much more linear “needle-like” one for later ones, such as the present piece. The true appeal of this specimen lies however in its unusual dial configuration, defined chiefly by the red five-minute divisions. Such dials - now known by the Omega community as “Racing Dials” - are extremely rare to find - especially in such flawless condition. 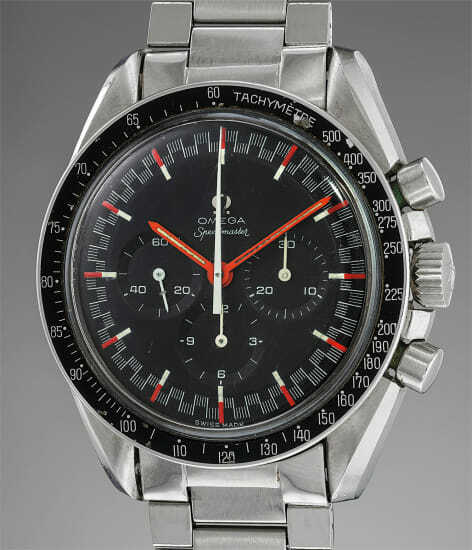 Beyond their aesthetic appeal and rarity, they also represent one of the extremely scarce examples of Speedmaster dials featuring other colors than black and white.